Kadamb Kunj Resort is a 3 Star property catering to the needs of travellers visiting the town of Bharatpur, especially Keoladeo Ghana National Park. With an excellent combination of modern amenities and warm hospitality, Kadamb Kunj Resort offers a memorable stay to its guests. 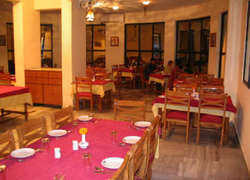 Kadamb Kunj Resort is situated on Fatehpur Sikri Road (NH 11) in Bharatpur, Rajasthan. While Bharatpur Railway Station is 7 km away from the property, the nearest airport is located in Agra. Bharatpur Bus Stand is about 3 km away from the resort. Laundry Facilities, Business Facilities, Airport Transportation, Gardens, Internet/Wi-Fi, Currency Exchange, Secretarial Services, Swimming Pool, Breakfast Services, Bar. Desk, Bottled Water in Room, DVD Player, Cable/Satellite TV, Attached Bathroom, Internet Access, H/C Water, Complimentary Toiletries, Television Room, Safe Deposit Locker Facility. Breakfast Services, Business Facilities, Conference Hall, Doctor on Call, Laundry Facilities, Parking, Restaurant, Room Service, Secretarial Services, Bar. User reviews for "Kadamb Kunj Resort Bharatpur"
© 2017-18 HotelsInBharatpur.Net All Rights Reserved.